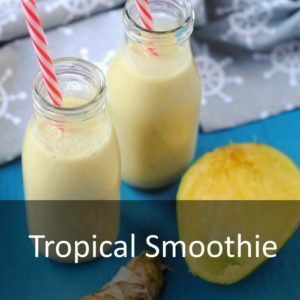 This smoothie really does define summer, and if it is really hot where you are, the try freezing the fruit ahead of time and use frozen fruit in this smoothie. It’s seriously refreshing and it will cool you down in no time. Freezing fruit is a great way to keep it fresh too, as no one likes waste. Hello, it’s Dave here! I am bringing you my first recipe post and I think it’s a pretty good one to start with. I mean, just look at how much fruit is in this. Not only do the banana, pineapple and mango all contribute to the flavour, but there is some turmeric in there too. I am the first to admit that I am not the healthiest person in the world (despite being married to a healthy food blogger, the chocolate still always seems to find me), but recently I am making more of an effort. A couple of years ago I took up running and I got to a standard that I was really happy with, but then life got in the way and I stopped running and I am now back at the start, trying to build my running stamina up again. I am trying to head out for a run around 3 times a week and just focus on increasing distance rather than setting a time goal. 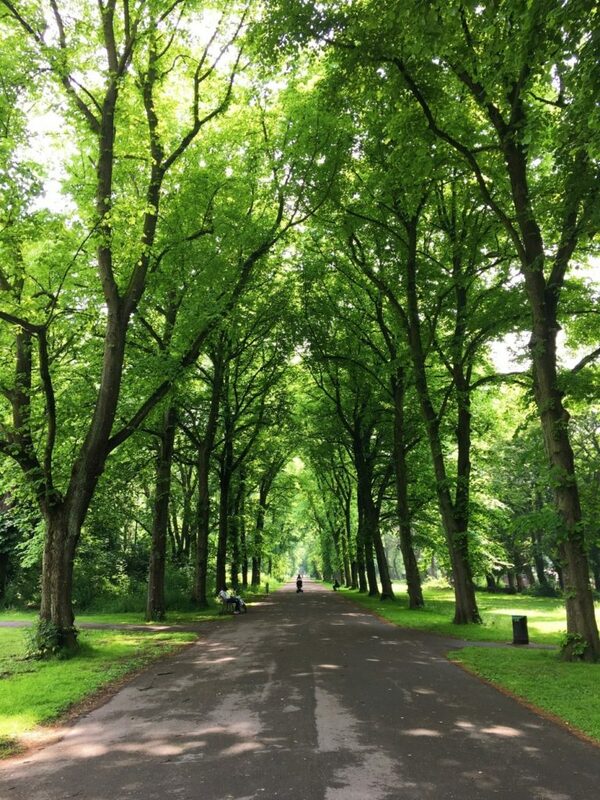 The most important thing is that I am enjoying it again. 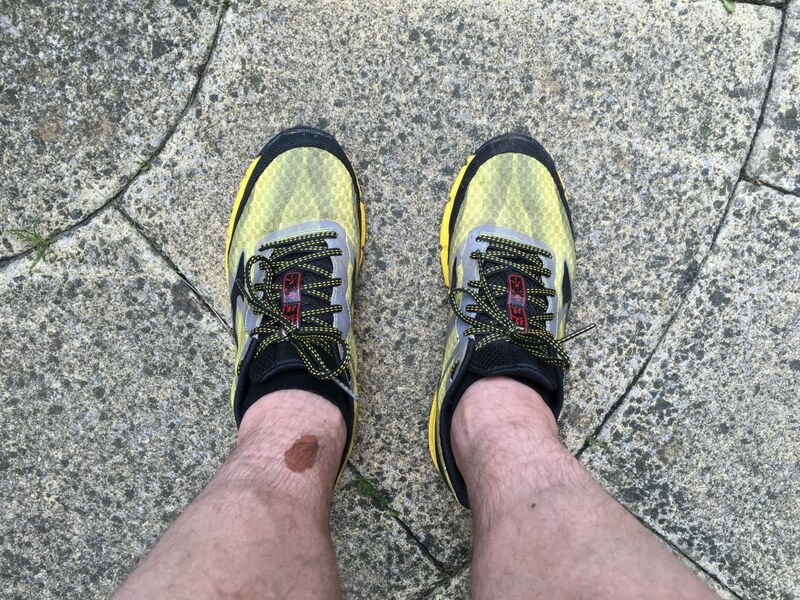 I seem to be prone to injury when running, so I am making sure that I take it easy and do everything I can to help myself, like taking some supplements. I had been reading that turmeric was a good anti-inflammatory and good for the joints, so I was intrigued to try those and when Pukka contacted Dannii, I said I would be happy to try out their turmeric supplements as she is unable to take them due to being pregnant. 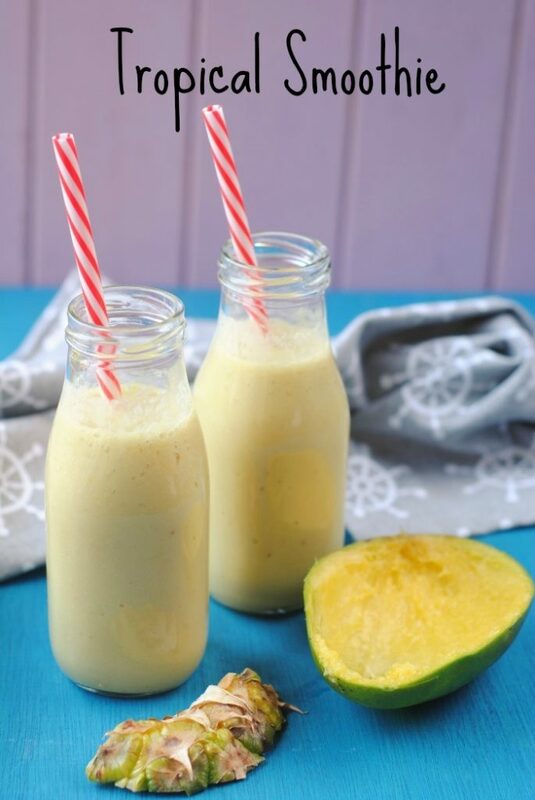 I’m not great at taking tablets, so I wanted to find a way to use them in a recipe and the first thing that came to mind was a smoothie, as I am trying to increase my fruit intake too. Pukka’s Turmeric Active is a great anti-inflammatory, good for skin, joints, antioxidants etc. Pukka’s turmeric supplements are 100% organic and made using the finest ingredients, so no strange ingredients added to them. Pukka Herbs’ Turmeric is ten times more concentrated in curcuminoids and one and a half times more in essential oils in comparison to just turmeric root. If you are like me and you find it difficult to get everything your body needs through diet alone, then supplements can be a great choice and Pukka is the place to get them! Also, you need to take a look at the Pukka Organic Teas, because they have an amazing selection of flavours – the lemon and mandarin is my favourite at the moment. You will see some more smoothies from me over the coming months, as well as other quick and easy ways to get more fruit and vegetables in your diet. That is my main aim at the moment, and if that if yours too then join me in enjoying recipes like this. How can you not enjoy something tropical like this? I just wish I was drinking it on a beach somewhere. 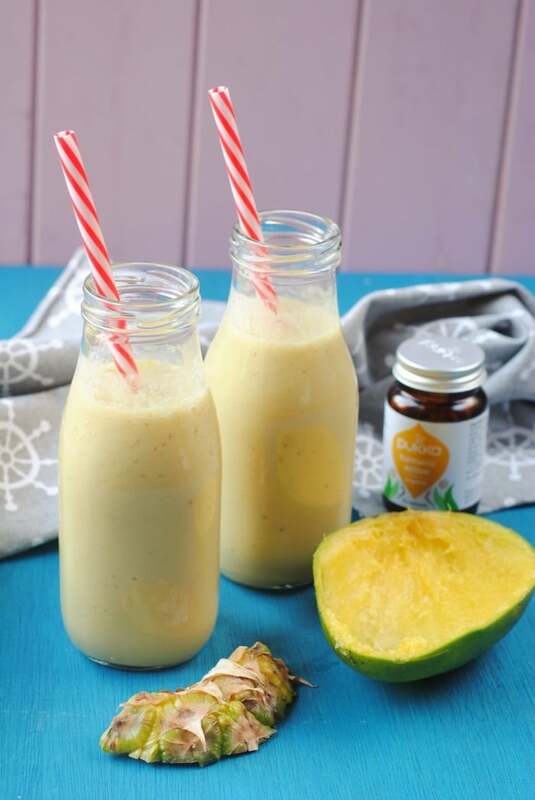 Packed full of delicious pineapple, mango and banana, this Tropical Smoothie is a treat for the eyes and the taste buds. Put all of the ingredients in to a blender and blend until smooth. thanks for sharing. didn’t know that turmeric can be added to smoothies. 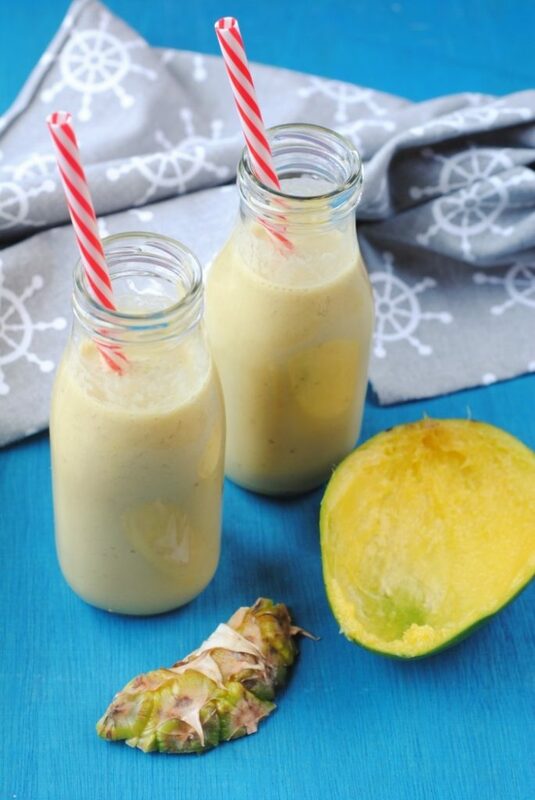 This smoothy looks very healthy and good for the body! 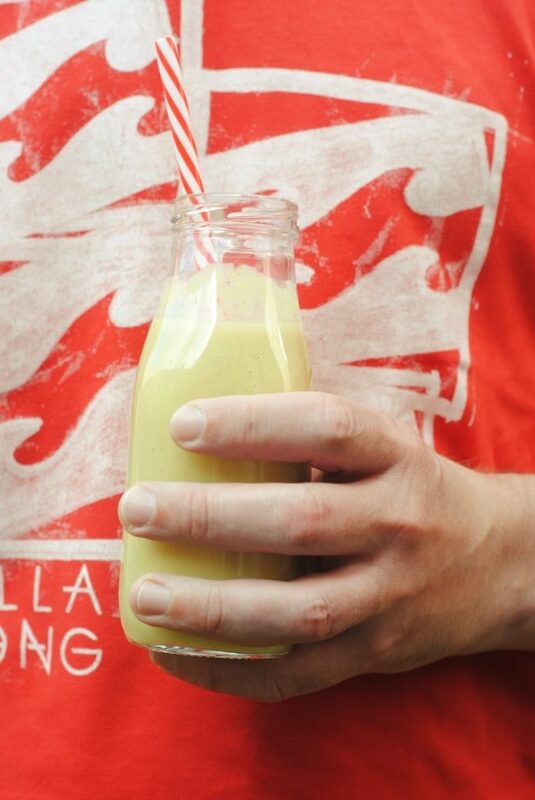 It looks perfect for in the summer because it is a topical smoothie. I like the ingedients and the combination of the smoothie. Smoothies are a good replacement for snacks in the afternoon. I love smoothies because they are very easy to make. You just have to drop the fruit in the mixer. These are very good receipts. The smoothies are tropical and that’s something new for me! This is definitely a good first recipe! Looks delicious, Dave. I like the idea of adding turmeric for colour and for the anti-inflammatory goodness. Sounds and looks delicious and just the kind of smoothie my girls would take for a school packed lunch. An interesting twist adding the numeric as well. Not a flavour I would have thought of adding but intrigued to see what it tastes like now. Ah that’s a shame about Dave getting injured with running so much (I feel you!! I’m a fellow injury proned runner). Turmeric is great though. I sprinkle the spice on most of my dinners! The supplement sounds great. The addition of turmeric got me interested! Nice! I love smoothies so this is a great recipe to add on my list. Thanks! I need to try this it looks so yummy!! Ooh hello Dave! This looks yummy and what a great idea to blend the supplements into a smoothie! 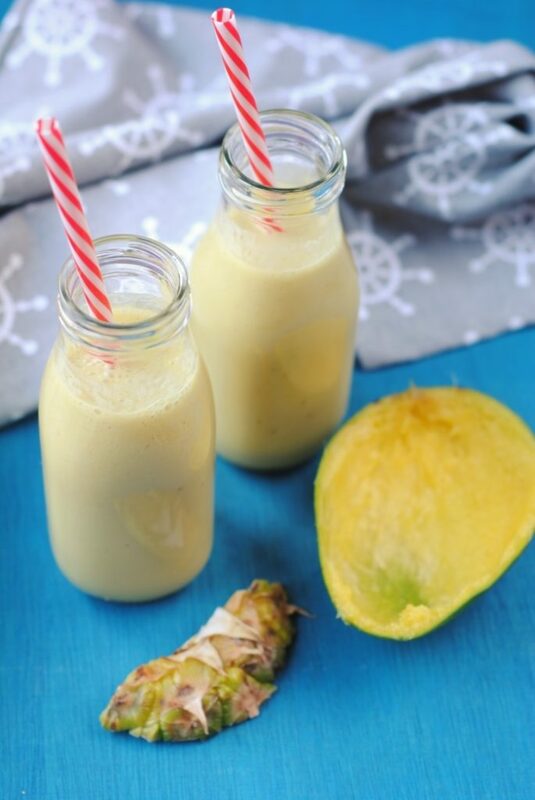 I think I’d swap the numeric for ginger, any smoothies I love with ginger, this looks delicious!!! Okay, yum! Love a sweet and satisfying smoothie!